A team of 10 Slovenian MICE providers successfully represented Slovenia, and its capital Ljubljana, at a workshop held in Paris intended for important players in the French meetings industry. In early March, the Slovenian Convention Bureau, in co-operation with the French MICE agency Partance, organised and held a workshop in Paris intended to present Slovenia, and in particular its capital Ljubljana, to a French community of experts in the MICE industry. The French meeting planners were welcomed by Andrej Slapničar, the Slovenian Ambassador in France, who emphasised the importance of continuous economic co-operation between Slovenia and France in business tourism. The Slovenian meetings industry has been recording a growing number of business guests from France, in part due to the good flight connections between the two countries, which makes France a market with a large potential for growth in terms of Slovenia and business tourism in its capital. Therefore, the Paris workshop set the necessary grounding for expanding existing connections. More than 30 top French meeting planners participated in the workshop where they had the chance to find out more about the opportunities for organising events of various sizes in the Slovenian capital and beyond. The ten Slovenian partners presented their range of congress services, hospitality, and DMC programmes, and offered an informative insight into the wide range of options that Slovenia, and particularly Ljubljana, can provide for the organisation of congresses, business meetings and incentive programmes. The participating partners from Slovenia were: The Ljubljana Convention Bureau, Union Hotels, Hotel Intercontinental Ljubljana, Bernardin Group, LifeClass Hotels, Hotel Kempinski Portorož, Sava Hotels Bled, ECO Park Bohinj, Intours DMC and a French representative of the largest Slovenian airline Adria Airways. The business discussions were complemented by excellent cuisine. The Slovenian team brought one of the country’s most acknowledged chef’s, Igor Jagodic, to Paris – the gastronomic capital of the world. 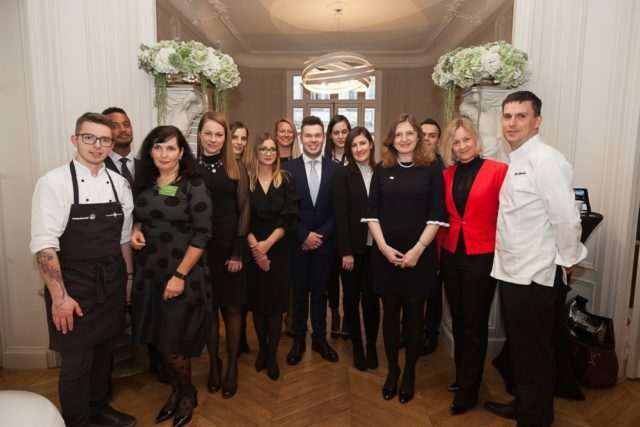 The chef, from Ljubljana Castle’s Strelec Restaurant (owned by the Kaval Group), successfully impressed the French guests with top-notch culinary specialities with a local touch. The food made an excellent accompaniment to the meetings between Slovenian providers and French clients and contributed to the positive outcome of the workshop. The numerous new business contacts made by participants at the event promise further growth of the Slovenian business tourism industry, which will be further upgraded through additional planned marketing activities for French clients in Slovenia and in France.